This whimsical ring has a stylish and unique asymmetrical design. The beautiful center stone is a 10.00 carat emerald cut amethyst with a fabulous purple color. Set in a platinum mounting there are also 21 round brilliant diamonds that total .50 carats. 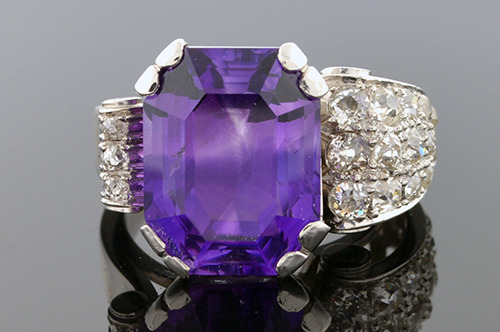 The diamonds cleverly form a wave that seems to flow out of one side of the amethyst. Sizing available.